Domestic goddess gardener ATC for Artful Ideas, originally uploaded by DianthusMoon. Wanted to share a cool Artist Trading card (ATC) I made as a challenge (which I ‘sort of” thought up as influenced by Melissa at Honey Girl Studio). 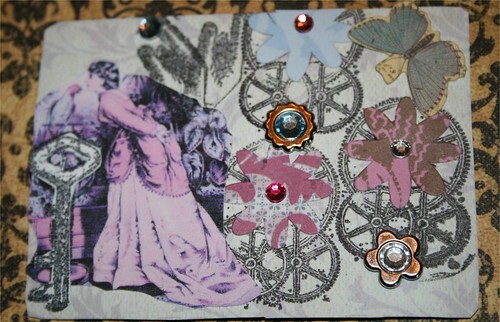 Lucky for me I received a nice array of the steam punk stamps in an order yesterday from Paper Wishes (nice company)! What is ‘steam punk’? It’s taking the influences of say Jules Verne and that era and applying it to that time-lots of gears, clocks, keys, that sort of thing. Did you notice the parrot had a key for a stand? Do you think it’s right for a certain office you go to a few times a year to send you one big bill all at once for procedures from 6 months ago to now? That’s what happened to us today. We don’t have $800 kicking around. They know that we have a certain deductible, so why not ask if we can send so much a month way back in September and on? For one thing they charge too much. I will be paying them over $100 on Thursday. Feel like giving them a piece of my mind! I will be on the look out for some kind of work because we have so many bills lately. I hate when they don’t send a bill for months after the procedure! I can’t understand why it takes so long to get the bill. I think it’s ridiculous and if they can’t get a bill out within 30 days, you should not have to pay it! I have read all those J. Baker books. My MIL says that gardening shows have not been the same since he left. and yeah, that is insane that you got a bill for that amount this far out from the work being done! hope you can work something out with them.